Once in a while golfers catch a break. A product comes out that meets the marketing hype behind it and we are blessed with a piece of equipment that works as it is described. This device certainly had a lot of marketing hype behind it. Did it live up to the potential? After you get through this review, you will know the answer. When we first heard about this GPS device it sounded almost to good to be true. THP has tried out almost every single device out there in this category and liked most of them. 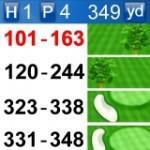 I have personally used a Skycaddie for quite some time and I really like it. It does what it is supposed to do. I know many would argue that a Range Finder is needed to get exact measurements anywhere on the course. That could be until NOW. Easy to understand graphics that display golf hazards such as sand traps and bunkers, as well as your current location on the golf course. Large 2.2 inch, high-resolution 320 x 240 color screen that is easy to view outdoors in bright sunlight. Through the use of SmartView technology, the uPro automatically presents dynamically generated “viewports,” which show you information based on your next potential shot. As your position on the course changes, so does the view of the course. The uPro is thinner, sleeker, and lighter than any other product on the market. It fits easily in the pocket or on a belt without obstructing your swing. As an add-on software download, the device can accept voice commands to make menu navigation virtually hands free. 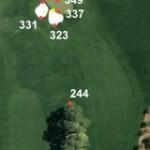 Provides the user with a list of all golf courses in the U.S. The GPS technology programmed in the uPro provides an automatically sorted list of golf courses closest to the current location of the user. That all sounds great doesn’t it? The real question is, does it work! We have given it a try over the last two weeks and here is what we have found it…It is fabulous. First off, I want to discuss price. The unit costs about the same or even a few dollars less than just about every other full color GPS unit out there. MSRP on the unit is $399.99. The “no subscription fees” is something that we were very unsure of. Folks, it works. Normally you will pay a yearly rate to have downloads. With this device all of the “basic downloads” are free and give you all the info you need to enjoy the unit. If you want “pro mode”, you pay a few dollars per course. I will go on and explain the details of the two modes a little later. So the cost is not out of line with any of the other GPS units out there now. Let me get into form factor a little bit. This device is small. We have seen units smaller but not that do what this one can. It has a full color screen that is nicer than any we have viewed up until this time. The UPRO is also very thin. It can fit in your pocket while playing without you even noticing that it is there. What does all of this add up to? If you do not like the big clunky models, this one is for you. We only had one issue with the form factor at all. We gave a unit to a couple of our “senior” reviewers to test and they said that the font was a little small. Our testers did not have that issue, but some might want to look into it. When you power up the device and select your course, you are immediately taken to a fly over of the hole that you are about to play. It is a thing of beauty to see the markers all there as well. The fly over worked well and it was a neat little thing to help you out especially playing at courses that you do not know as of yet. I could go on and on about the view but we have to get on to whether the unit actually works. 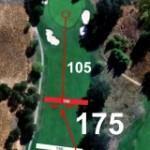 The accuracy of the unit seemed spot on and the GPS seems to move a little faster than my skycaddie. 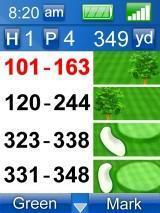 After our tee shots, we pull up to the ball and the first thing I notice is on the screen it has all of these numbers. No more having to change 5 screens and scroll to see where a bunker is. It has tons of info right there for you. This was a feature that I simply loved. Another feature of note here is the fact that there is a cursor. Some might ask why? Because with this device you can find out so much more as well, that’s why. It is part of their “AnyPoint” feature. It does the job of a range finder for you. 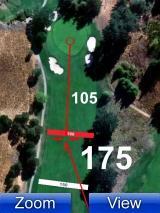 You take the cursor and point it at anything on the hole and it gives you the distance from where you are at the time. Maybe the coolest feature I have ever seen on ANY golf device. With the screen playing video we were a little nervous of the unit in the sun. Never came up once. The graphics are crystal clear and make my color Skycaddie look like a joke. The device is extremely user friendly and holds 50 full courses on it. Plus it has expandable memory. Again putting my Skycaddie to shame. The unit has two modes. Basic and Pro mode. Basic mode consists of what you are used to in a GPS. Graphics with a few pictures and distances. That is completely free with this device. You can upload as many courses as you would like and never have to pay for them or have a subscription. Pro Mode offers something a little more. It gives you the Smart View that we discussed in which it gives you all of the measurements right from the front screen. It has a video flyover of each hole. And it also incorporates the AnyPoint technology that we spoke about above. We found ourselves comparing it more to the devices found built into carts at certain clubs rather than a handheld. But it even does more than those built in devices do. The only thing missing from this device is the ability to order food at the turn. The UPRO GPS is simply the best GPS device on the market right now. You can put it side by side any other unit out there and there just is not a comparison. We gave a unit to two different testers and both of them are shopping for the unit as we speak. We have never had a single product tested by multiple people that had those kind of results. So maybe there is hope. Maybe we have found a product that lives up to the marketing hype that many others fail to. I urge anyone in the market for a range finder or GPS to give this unit a try. For more information on UPRO please check out UPRO. To Billybob: If you are using IE9 delete it and go back to IE8. That solved all my connect and sync problems. Also on connect problems, go to My computer after turning on Upro and see if it shows up in my computer. If it does, click on it to open then look for Upro finder (usually at the bottom of the list. Open that site and keep Upro connected and on. This should take you to Upro website . It sounds like you haven’t been able to register your unit yet. Must register then you can add courses ,Personnal info ,preferances ,etc. After adding at least one course sync button should be lit. Sync anthen when message saying sync completed you will get message to remove usb cable. On the upro you will get a message saying usb disconnected. Then it says turn off upro. This is IMPORTANT. Turn it off then reconnect and you should be OK. I have been exploring for a bit for any high quality articles or weblog posts on this sort of space . Exploring in Yahoo I at last stumbled upon this web site. Studying this info So i am glad to convey that I’ve a very just right uncanny feeling I found out exactly what I needed. I most indisputably will make sure to do not omit this web site and give it a glance on a constant basis.